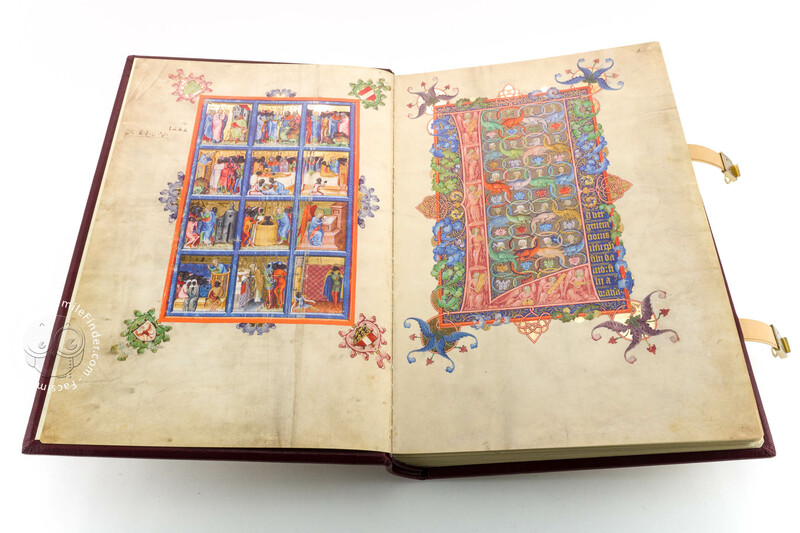 This Evangeliary, a service book which contains extracts from the gospels to be read out during the mass, is a masterpiece of Bohemian-Moravian manuscript illumination from the reign of Emperor Charles IV (1347-1378). 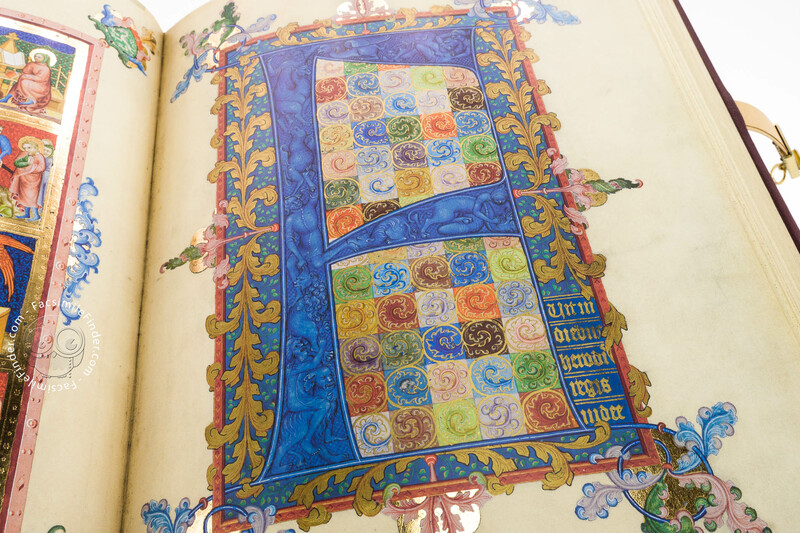 It dates back to 1368 and the armorial evidence suggests that it was made for Duke Albert III of Austria, to whom it was probably given as a gift from Jan Streda, the Imperial Chancellor. 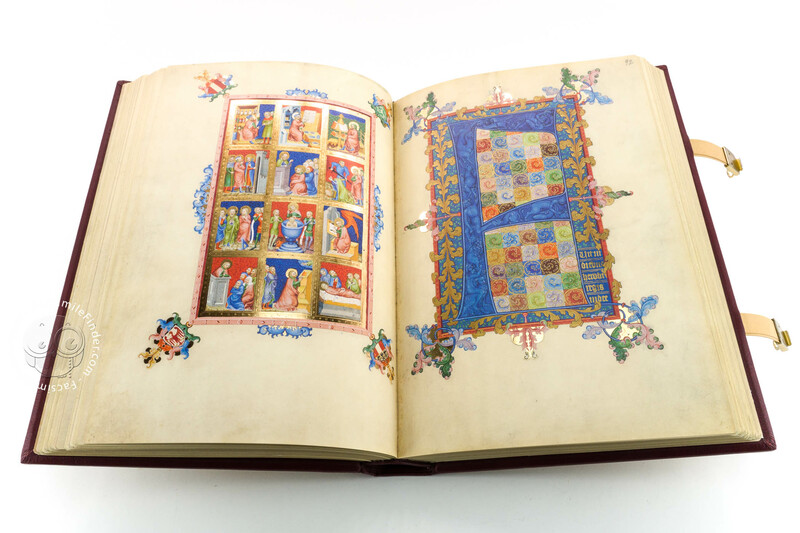 Johann of Opava (current name for the northern Czech Republic city of Troppau) uses the Textualis Formata to write the four Gospels. On fol. 190v. 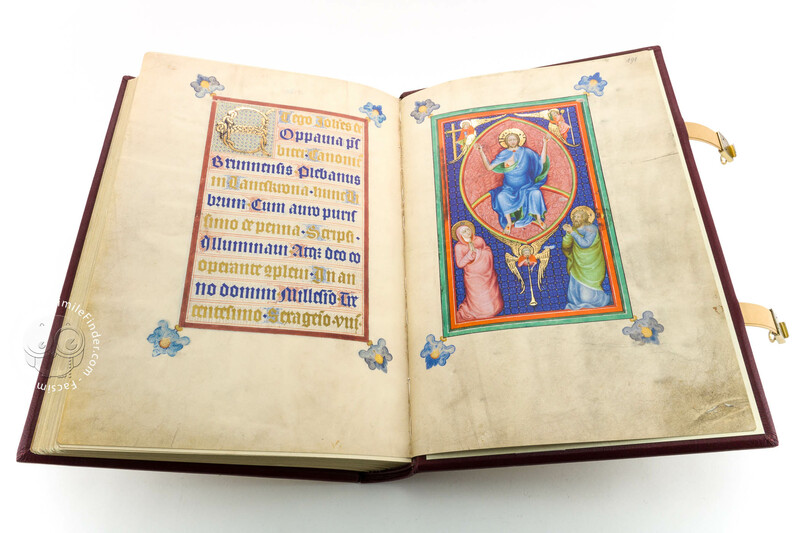 the author tells us with his own words that that he wrote the text with an ink of pure gold in the year of the Lord 1368 (Hunc librum aim auro Purissimo de penna scripsi…), thus the work can be dated with certainty. 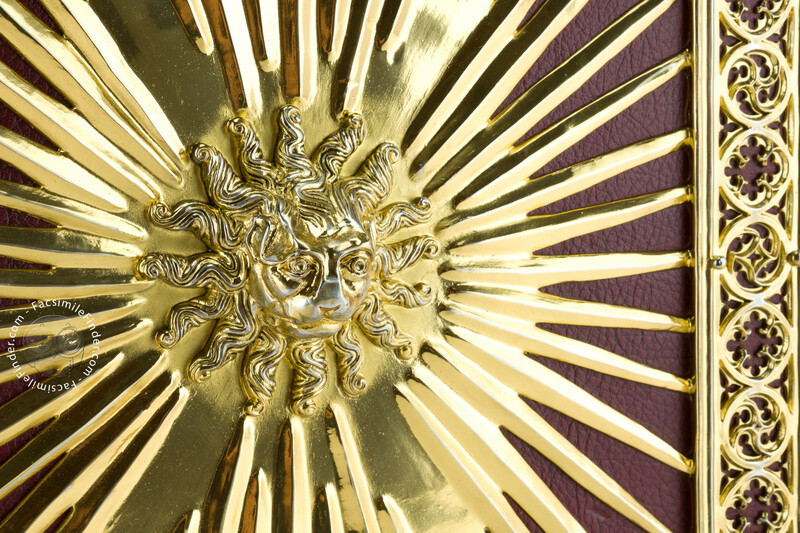 Although the overall design must be credited to him, other executors were involved in its production. 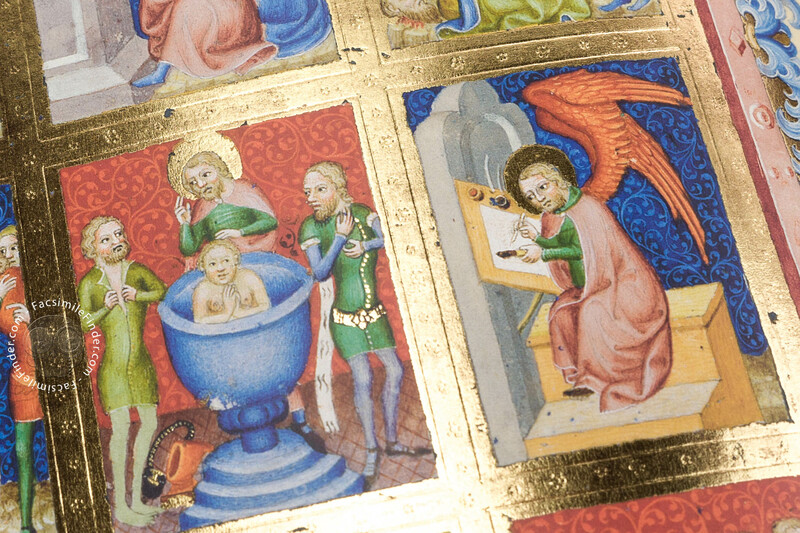 The Evangeliary originated in an atelier close to Chancellor Johann Neumarkt workshop. 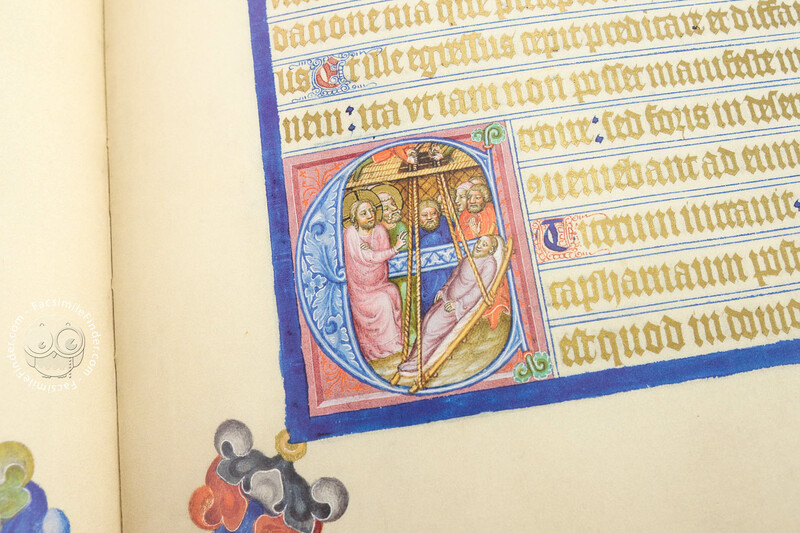 In the decoration of the work, three were the hands involved: the Main master Johann of Opava, an assistant and the miniature painter of Johann Neumarkt’s Missal. 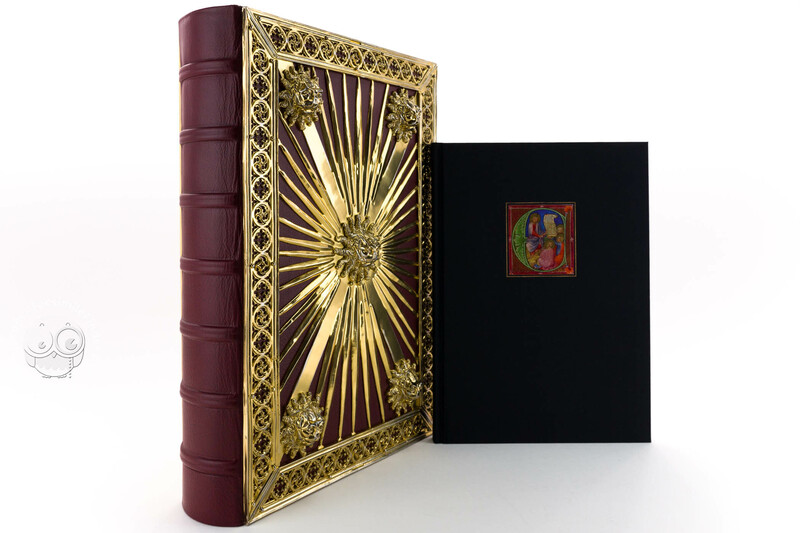 The Evangeliary contains the four Gospels of the New Testament (Matthew, Mark, Luke, John). 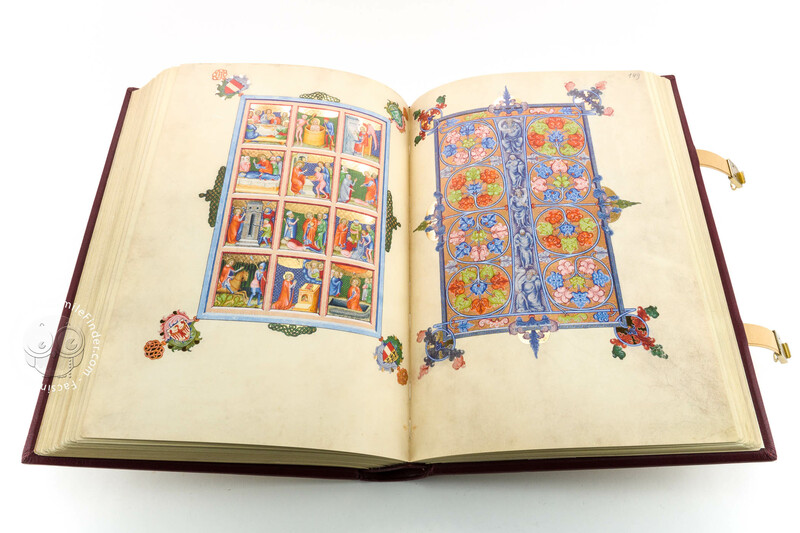 The Gospels do not include the preface of Hieronymus, and also missing are the canon tables. 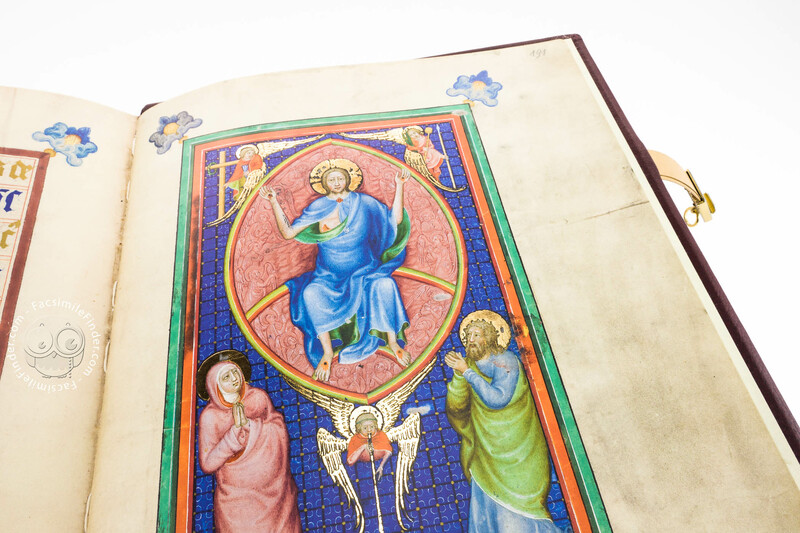 Nevertheless it is possible to identify the structure of the four Gospels. 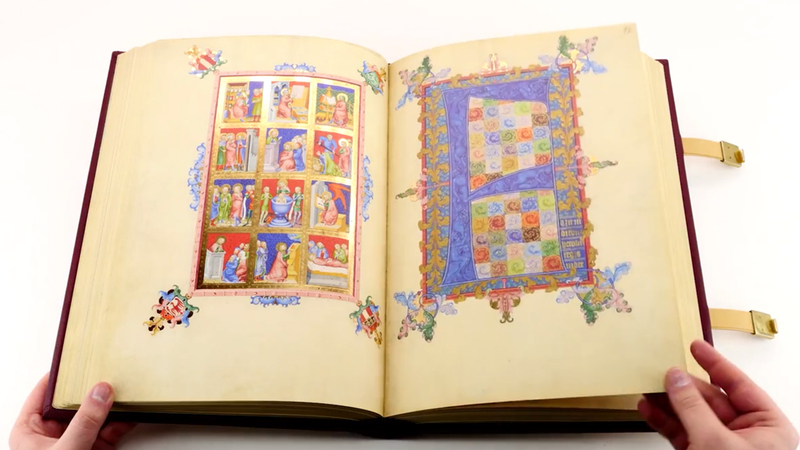 The absence of the canon tables indicates that the Gospels was probably not intended for liturgical use, but rather for a representative purpose, perhaps as the Vienna Coronation Gospels. 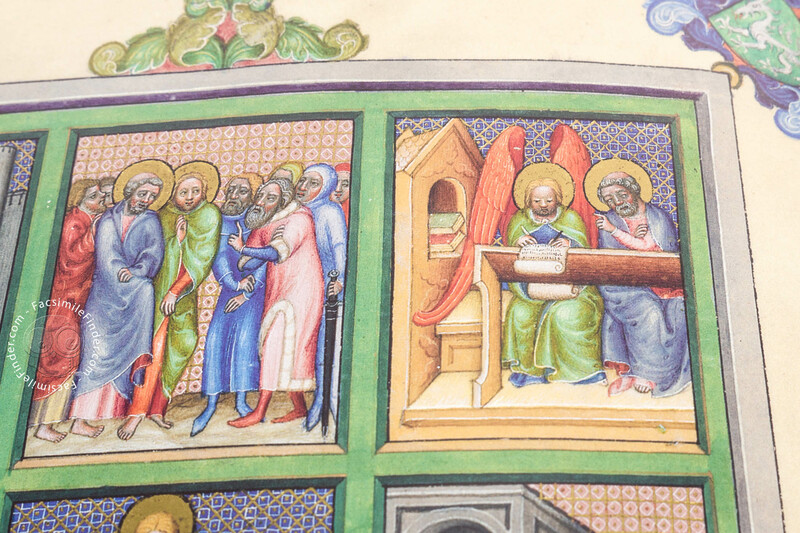 The text of the preface to Luke’s Gospel is missing. Thus, the first letter of St. Luke’s preface is not Q (quoniam quidem multi Conati sunt..”, Lk 1.1), but F (“fuit in diebus Herod dis regis”, Lk 1,5). 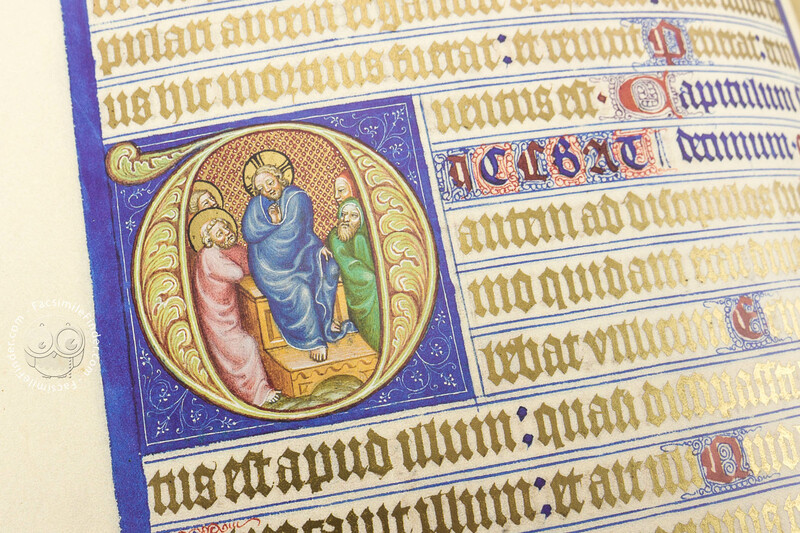 For this reason the Gospel starts with a full-page F and not with a Q initial, common in the pre-Romanesque and Romanesque illuminated manuscripts. 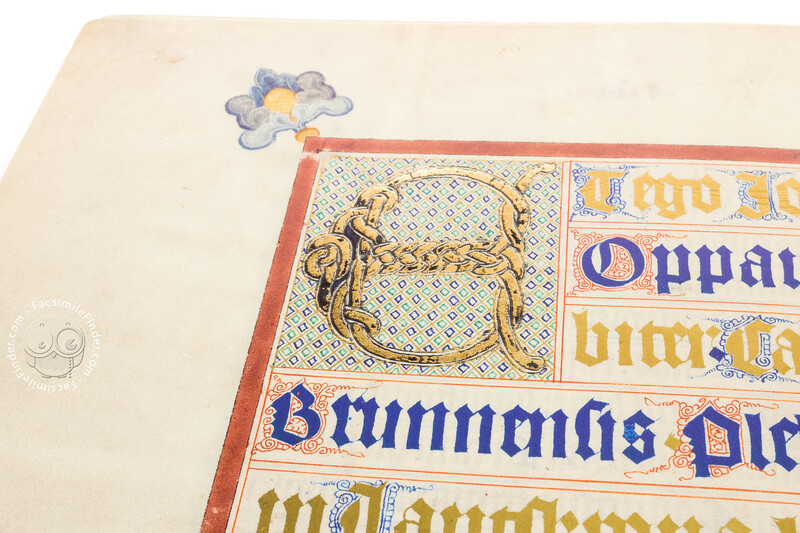 Both historiated initials and fleuronneé initials can be found. The majority of the historiated initials occupy a height of five lines, with P, F, and H-type being the only exception. Due to the lower or upper parts of the shafts, which extend over two to four lines, they can reach a height of seven to nine lines. 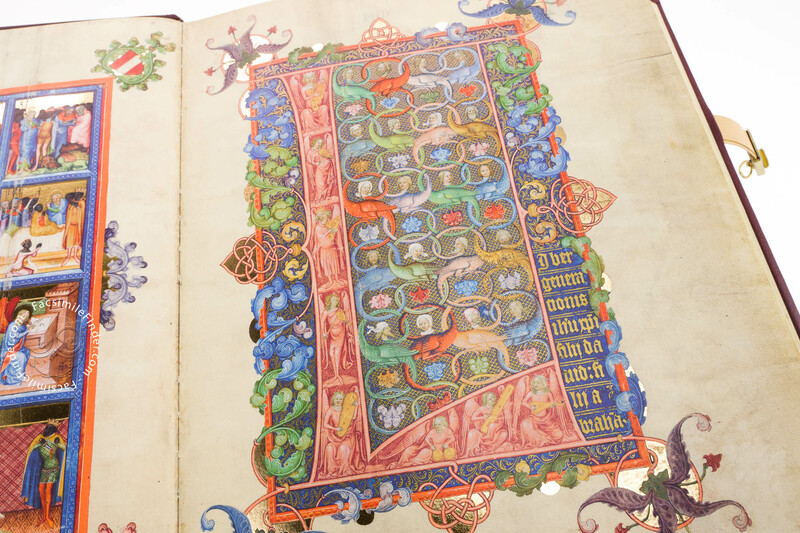 The manuscript was written continuously with 22 lines running in a very regular Textualis formata in gold lettering. However, a different font type and a different font size can be found in the colophon at the end of the text on fol. 190v. Textura sine pedibus is here used. Its most striking feature is that letters like a, i, and the minims are missing the lower shafts, hence “sine pedibus“ meaning “footless”. 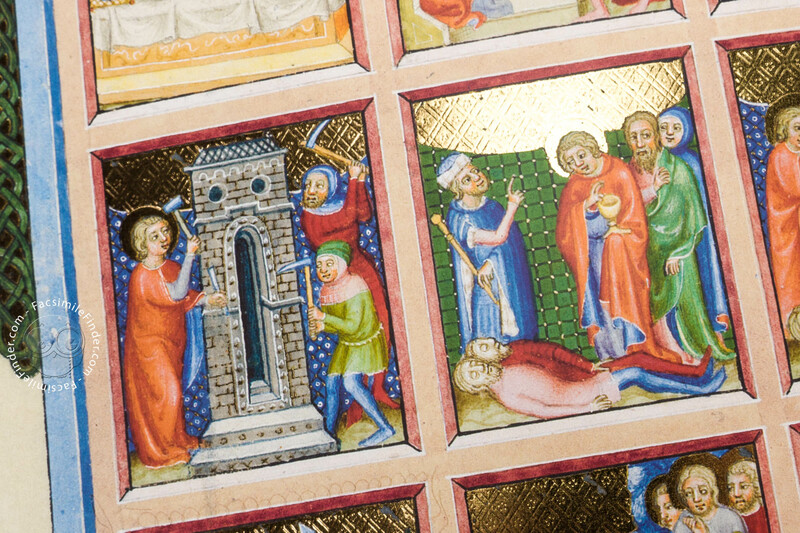 Before each of the four Gospels, one full-page miniature sequence is inserted illustrating the legend of the respective evangelist in twelve smaller frames. 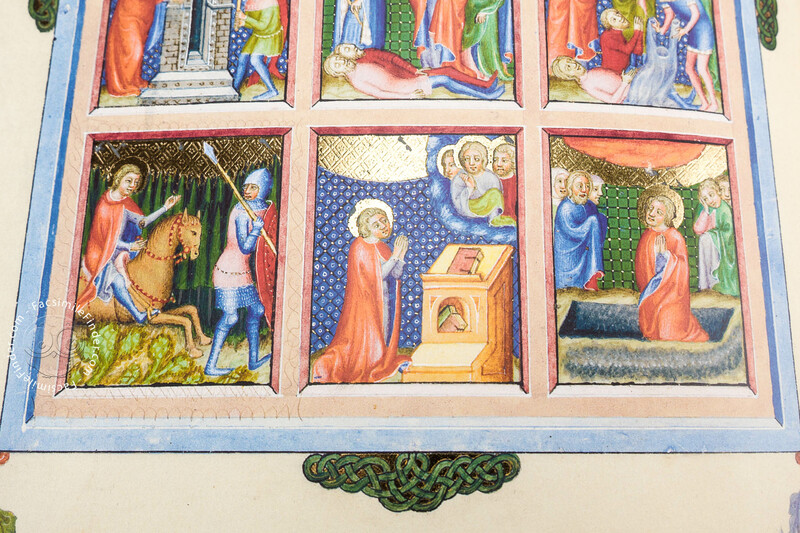 Furthermore, the miniature on fol. 55v. betrays an influence by Italian Trecento painting. 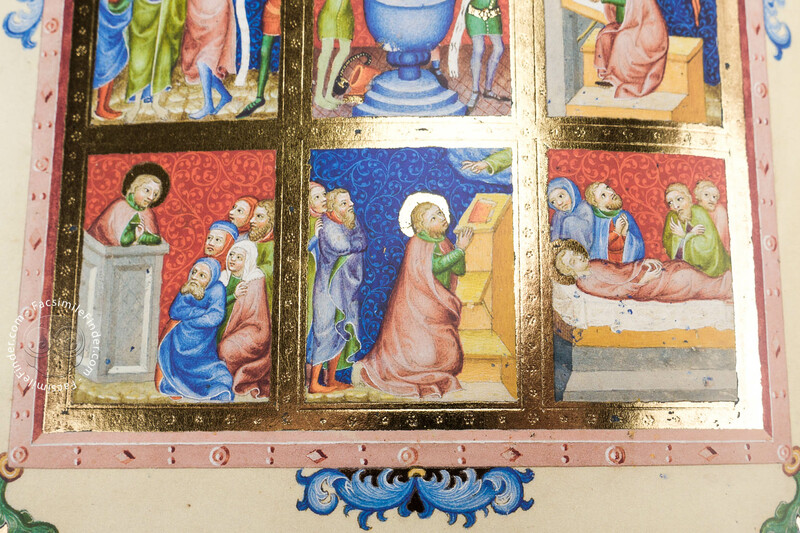 The full page miniature of Deësis is the final point of the manuscript (fol. 191r. ): in Byzantine art, and later Eastern Orthodox art generally, the Deësis or Deisis (Greek: δέησις, "prayer" or "supplication"), is a traditional iconic representation of Christ in Majesty or Christ Pantocrator: enthroned, carrying a book, and flanked by the Virgin Mary and St. John the Baptist. 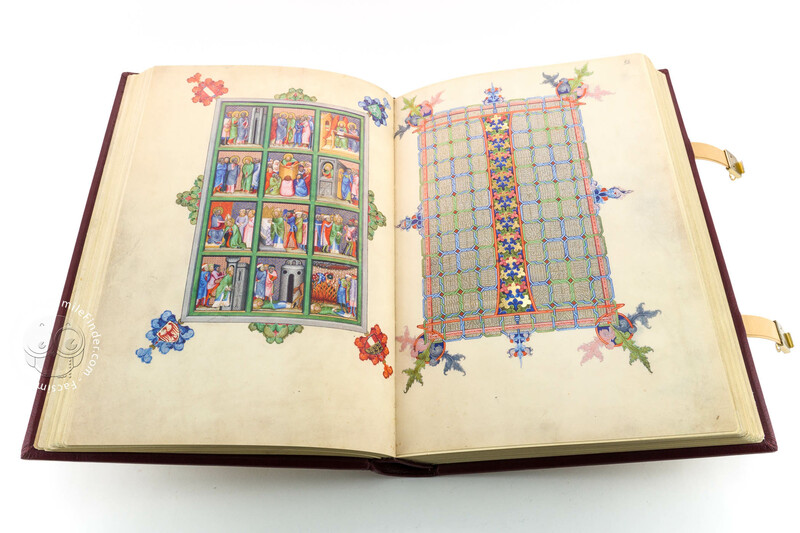 Manuscript book on parchment − 25.5 × 37.5 cm − 382 pp. Full-size color reproduction of the entire original document, Gospels of John of Opava: the facsimile attempts to replicate the look-and-feel and physical features of the original document; pages are trimmed according to the original format; the binding might not be consistent with the current document binding. Edition produced by Wissen Media Verlag on behalf of the distribution trademark Coron Exclusiv. 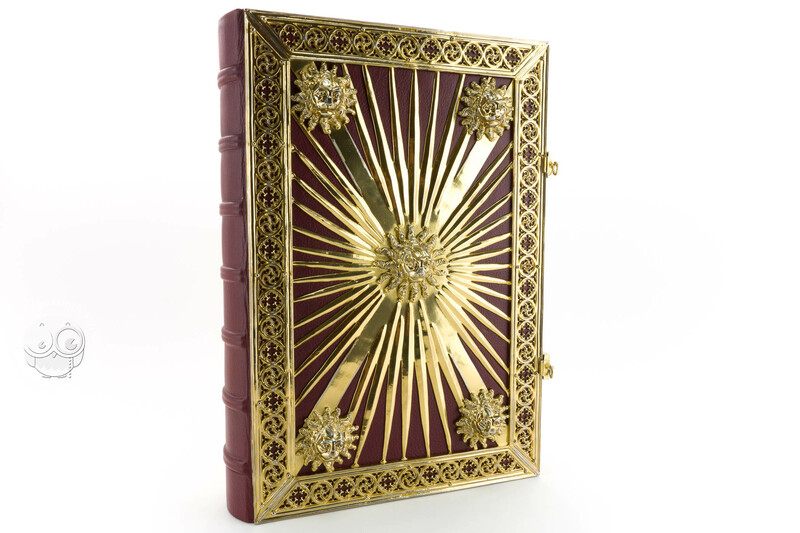 The work on the cover - a work of gilded silver - gives the impression of a special treasure.